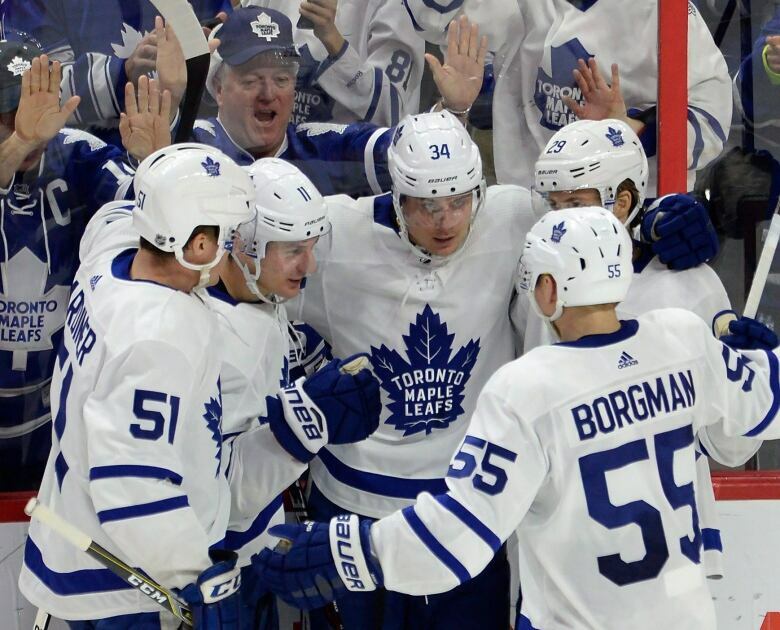 Connor Carrick scored the winner as the Toronto Maple Leafs erased a two-goal deficit in the third period Saturday to defeat the Ottawa Senators 4-3. Veteran Patrick Marleau didn't have to score to spark Toronto's comeback. 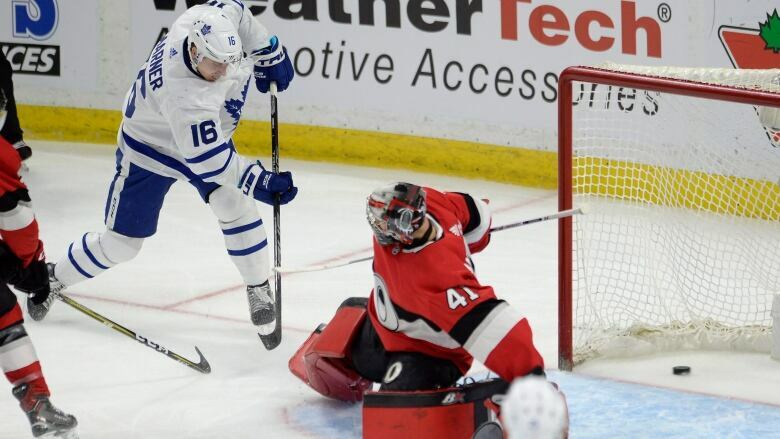 Connor Carrick scored the winner as the Leafs erased a two-goal deficit in the third period to defeat the Ottawa Senators 4-3 on Saturday. Toronto went into the second intermission down 3-1, and got an earful from Marleau in the locker room before returning to the ice for the final 20 minutes. "When Patrick Marleau steps up to say something in the locker room guys listen," Auston Matthews said. "He's a pretty soft-spoken guy but when he says something you have to listen up and he kind of got the ball going." Carrick took a wrist shot from the point that went over the shoulder of Craig Anderson and in at 8:58 of the third period. The Ottawa netminder didn't appear to be screened on the shot. The win snapped a four-game losing streak for the Leafs (26-17-5), who also got third-period goals from Matthews and Mitch Marner. Zach Hyman scored in the first, Jake Gardiner had three assists while Frederik Andersen made 15 saves. Erik Karlsson, Mike Hoffman and Tom Pyatt had goals for Ottawa (15-20-9). 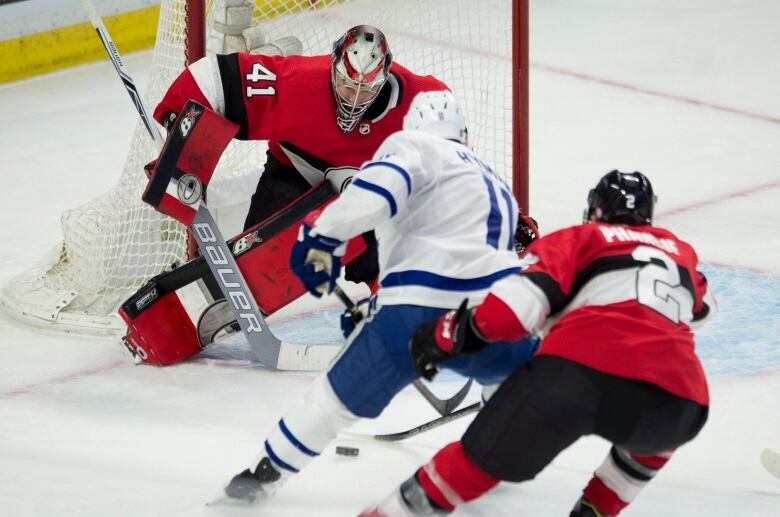 Anderson made 29 saves as the Senators scored at even strength, shorthanded and on the power play in the second period to take a 3-1 lead after two periods. The Leafs scored twice less than two minutes apart in the third to tie the game 3-3. Matthews got it started at 2:53. Marner then scored at 4:21 on the power play as he cut to the front of the net around Johnny Oduya and then used a toe-drag to get around Anderson and score. "We weren't happy giving up a goal on the power play. We've been doing it too much lately so it was nice to get one back,' said Marner. "It was a great comeback for us and very exciting.. It's always a great atmosphere in here. It's always fun playing here with the Battle of Ontario. Growing up I watched it and now to be a part of it is pretty special." Karlsson tied the game 1-1 at 3:08 with Matthews in the penalty box for high sticking. A rebound off a Mark Stone shot went directly to Karlsson in the left face-off circle and he beat Andersen with a quick shot. The Senators then took their first lead of the game when Hoffman beat Andersen short side from the right face-off circle at 7:12. "I thought we played OK in the first period and in the second period we really stepped it up and built ourselves a good lead going into the third period. Give them credit the really made a strong push and we couldn't sustain it," Hoffman said. "There's times when we've been able to close it out and times where we haven't. This is one of them where the opponent made a real strong push and we weren't able to push back." Late in the period Ryan Dzingel took exception to a late hit Leafs defenceman Andreas Borgman delivered on Zack Smith. Dzingel jumped Borgman and received four minutes for roughing while Borgman got two minutes for interference. On the ensuing Leafs power play Smith setup Pyatt, who out worked Tyler Bozak in going to the net and beat Andresen with a shot to the top corner at 18:05 for a 3-1 lead. "It's a team you don't like losing to, that's for sure," Stone said. "We've had some success against in the past and were looking for some of the same, but it's hard to put a finger on it." Toronto had opened the scoring and led 1-0 after the first period. Hyman found a loose puck off a rebound and had an empty net to shoot at as Anderson was down and out of position after making the initial stop. The goal came at 7:26.